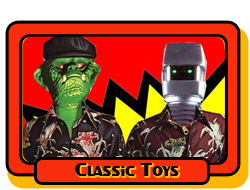 Obviously they are missing a few, I wish they had the Bionic Bigfoot episode . I enjoyed the show but I can see why it didn't least long and Jordan wasn't the right host to give the show legs. But either way they manage to cover alot. I uploaded it here. Enjoy. By the way, this evening there is a Toy Hunter marathon on Destination America which is a Discovery Channel channel. It’s part of my Optimum cable package. I’m not sure how widely it’s available across the country, but would assume its available in more than a few markets since its under the Discovery Channel umbrella. My problem with the show was the after effect. I would go to my usual resale stores and flea markets and everybody was marking up prices that did not make since. The would find a guid and mark there well used out of package figure for near-mint condition. That burned me from going to flea markets for years after.